Aeration is simply the removal of hundreds of small soil plugs from a lawn, to help break up soil compaction and improve root growth. How does aeration benefit the lawn? Aeration, also called coring or aerifying, is the best way to reduce thatch. Thatch is a tangled mat of organic matter that accumulates in your lawn. It is actually a tightly intermingled mat of dead and living stems, leaves, crowns and roots that forms between the soil surface and grass blades. Contrary to popular opinion, thatch is not caused by cut grass stems which are 90% moisture. Some thatch is perfectly normal. However, excess thatch creates a host of problems that includes shallow root development, nutrient imbalances to insect and disease infestations. 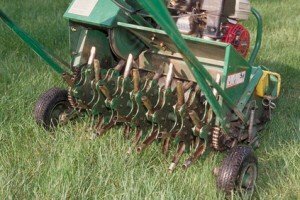 Aerating is one of the best things you can do for your lawn. It improves drainage, stimulates growth, helps relieve soil compaction and increases the effectiveness of fertilizers. Aeration is the process of removing small plugs or cores, from a lawn. These plugs are about 2 – 3″ deep and leave holes about 4″ apart. The plugs are deposited on the soils surface where they will disappear in about 2 weeks. It is important not to remove the plugs from the yard as they contain microbes that help break down the remaining thatch. Aeration should be considered at least once a year, and twice if you lawn has a heavy thatch layer or is compacted due to heavy use. We offer aerating in spring and/or fall based on your lawn’s condition. When should lawn be aerated? Annual aeration is beneficial for all lawns. 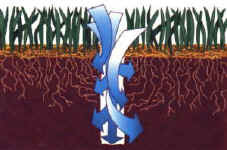 Lawns growing on heavy clay or subsoil, and lawns exposed to intense use, benefit from two or more aerations each year.